Greg Lynch graduated with a Bachelor of Dental Science from the University of Melbourne in 1987. He worked in private dental practice at Shepparton in country Victoria until 1991 when he relocated to Bundoora Dental Clinic where he has worked on a full time basis ever since. 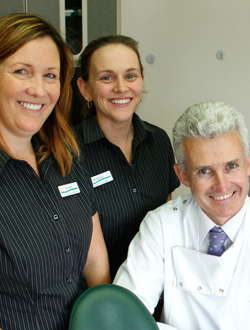 Greg practices all facets of dentistry and particularly enjoys treating children, teenagers and their families. He is passionate about the pursuit of excellence in patient care and high quality dental treatment for all his patients. Greg also has an interest in special needs patients and has many autistic patients referred through Autism Victoria. He is very interested in preventive dentistry, dental materials, restorative dentistry, oral surgery, veneers, implants, crown and bridge work and dental practice management. Greg is married with three children. His hobbies are tennis and gardening and he plays Pennant Section 1 tennis. He loves cars and motorsport especially the V8 supercars. His favourite day of the year is Bathurst.